Yesterday on the Write Time Blab we talked about taking your story idea from idea to story. If you have a hard time with this help is on its way. Story Shop is the brainchild of David Wright, Sean Platt and Johnny B. Truant prolific writers of story. They have started a Kickstarter to bring out the software in April 2016. Pledges range from $5 to Corporate Backing at $5000. Here's what Sean, Dave and Johnny say. Do you use notebooks and write things out by hand? Or do you prefer Microsoft Word or Scrivener? Do you use notecards to map out your story, then drag them around until the scenes fit? 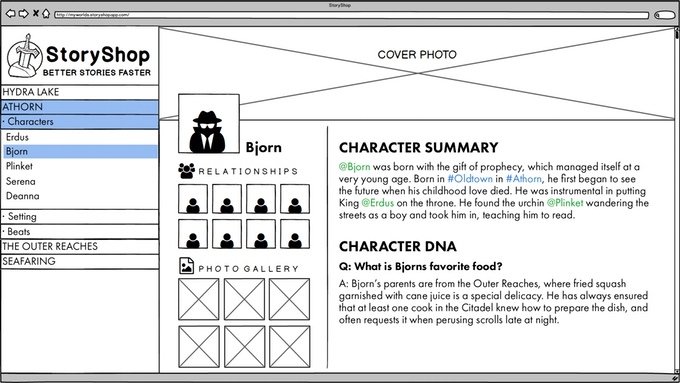 Do you write out full character profiles so you’ll know them well? If so, how do you organize those profiles? And hey, speaking of plot, are you a plotter? Or are you a pantser? Do you meticulously outline everything from your tale’s beginning to end … or do you just start writing and see where the narrative takes you? Either way, how do you keep track of your characters’ appearances and quirks? We know how hard it is to stay consistent with those things. And hey, have you ever gone to write a book's sequel … and realized you don’t remember which characters from the original were friends with each other, who knew which secrets, or even what hair color all those different people have? Planning stories and keeping track of all those loose ends is an inherently messy, chaotic process. It takes forever … and leaves you at least a little confused when you go to write your story’s intimidating first words. We’re always in the middle of several series at Sterling & Stone, set in many distinct story worlds. Keeping track of what’s happened and what needs to happen in the next book is tricky. Keeping track of who is whom — and who knows what — is even trickier. We practically maintain big, thick dossiers on each, as if our books are unsolved cases. We pre-plan our stories to make the whole thing as easy as possible … but there’s only so much that an inherently chaotic system can do. So we got to thinking: What if, rather than trying to track everything manually, there was an app that could help us? What if the app (not our messy, manual system) could keep track of relationships between characters the way Facebook and LinkedIn keep track of connections? What if we were able to tag scenes as taking place in locations we’d established, featuring characters we wanted to use … but because it was all a big, user-friendly database, we could sort through who went where and click links through places and people and happenings -- with everything being ABC Easy? We’d love to have an app that could do all those things. But unfortunately that app — that revolutionary story-planning tool to organize and make sense of our mishmash — didn’t exist.